Clove Bud Essential Oill is an essential oil extracted from the clove plant. Clove Essential Oil is a natural analgesic and antiseptic mostly used in dentistry, it cures tooth ache and is used in aromatherapy. Clove Oil is also used as a flavoring agent in foods, and is an herbal remedy for bronchitis, cough, cold, fever and infections. We are Manufacturers of supreme quality Clove Oil; we have a team of Fragrance & Flavor Development Centre (FFDC) to ensure pure and unadulterated Clove Oil reach the market. 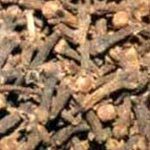 We offer two kinds of Clove Oil, namely Clove Bud Oil and Clove Leaf Oil.